Note: First post will count as #1. Next #2. And Onwards. Goodluck! What is it gonna be this time? Nah, nothing special. In this type of event. You'll get to win a Ticket to BoA that is worth (300PHP). Hey, I'm back! So Anime Corner Group Pilipinas Will Have Another Event? Technically It Isn't A Event. But somesort of a Raffle Draw thing. Everyone Can Join in! Even You. lol Even our Moderators can! There will be (3)choose Lucky Winners that will claim those tickets. Entry Submission will run from Aug 5, 2014 to Sep 5, 2014!! -MUST BE ONE OF WHO WILL ATTEND Best Of Anime ONLY. 1. Register on our forums. 2. Next step go on to this thread in the forum. 3. Follow the ::ENTRY FORMAT:: to qualify for this Event. --IMPORTANT: Your post counts as your entry for this Draw. Reason: Uhh. I Really want to see a "Special Cosplayer" that Caught my Eyes. And To meet my IRL Friends. Especially one that is Freaking far away from manila. and her 1st time to go to Expos. Well ^Totoo na To. kbye. 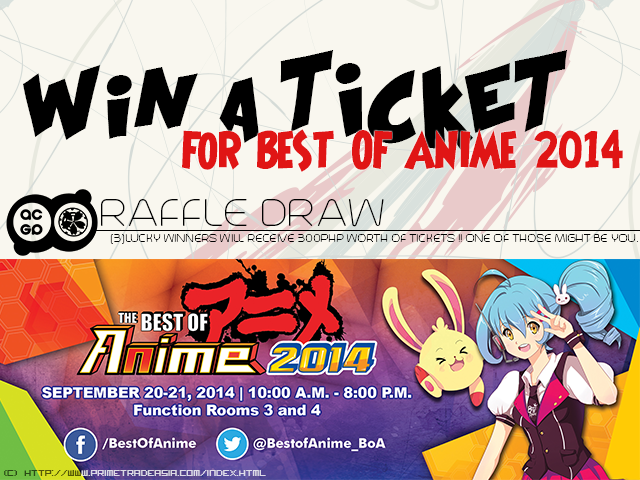 Reason why to win le ticket: I wanna enjoy the BoA with the Anime Corner Group Philippines! Reason(why you should win this ticket? 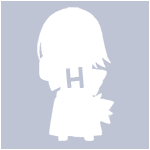 ): If i would win the ticket, i would be very glad because that will be my second time to attend an anime event. I have always wanted to go to events but have no enough money because of too many school expenses. Hope I can be picked. Reason: I've been to many conventions like Ozine, ComicCon, and etc. I must say that these events are almost always worth the money and time that I contribute to it. I have started attending to these sorts of events since 2012 and I must say that I enjoyed each to the fullest . This case here though is unique as I have never ever attended a single Best of Anime convention ever before and this raffle paved the way for me to hear this one for the very first time. So yeah, I think I should win this ticket because I deserve a piece of this very interesting event. Reason: This year, I already missed many conventions because I can't afford the transportation expenses and the ticket. I want to have a time to relax just for once in this year because, since my school started, what I only do is to study and do my requirements plus my allowance is really tight that's I can't afford to spend on something that is not related to my school. I could also use this event for my Project in one of our subject about the memorable events of my life. this is considered as spam Louise .-. please follow the format on regards participating in the event. I just want to "level-up" my love for anime. To be honest, it's my first time going to a con(OtakuExpo2014). So I'm looking forward to go to more conventions to meet new friends. Full Name: Ricardo D. de Guzman Jr.
Reason(why you should win this ticket?) Because, it's my birthday on BOA! hahaha! :3 But I don't have money, soooo... yay! Well our school organization,which is a anime organization, is gonna sell merchandise in the said event and also I want to enjoy my free time as much as I can before my thesis gets my schedule full again. Reason(why you should win this ticket? ): I want to try going in an anime event. why? because i want it. and also... this is the most important events of the year that i want to go. and want to meet the admins and the mods once again, and also some friends that i know in acgp. i know i have a work, but it's not yet payday and my salary is not that high though :3. and also i want it because... since the prize of the ticket is higher than expected, pamasahe pa lang papunta doon malaki na and i can't spend too much dahil sakto lang pera ko for sure. Reason (why should I win this ticket) I haven't performed in the Jpop singing contest last July, but joining in the Karaoke contest in BoA is almost the feeling of joining that competition. Top of that, winning a free ticket to Boa will give me a "double happiness" to myself because I want to meet the other karaoke contestants and support each of them especially for those first-timers and stage-fright contestants. Reason(why you should win this ticket? ): I want to go into an anime event and buy some stuff/things and most of all have HAPPINESS/ to be happy also to meet some friends. Reason(why you should win this ticket? ): Well this will be my 2nd anime event that i could attend if i won this ticket. just seeing/watching anime event makes me soooooo happy!!! If i won this ticket i might have new friends that i can talk to about anime related topics. :3. 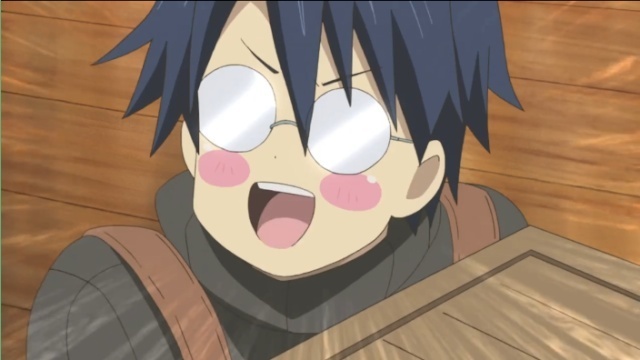 >_< its hard to keep it all to myself, the feeling of happiness, sadness, excitements and funny moments about any animes. feels like my thoughts are gonna explode if i cant express it. >____<. hahaha. Either way thanks for giving us opportunity to win a ticket and might be able to watch BoA! .